Kaminski Auctions kicked off their summer season with one of their most successful auctions of the year. The estate of the late Baroness Mary McFall de Gunzburg of New York City, New York and Miami Beach, Florida at their July 24th auction brought surprising results at what is normally a quiet time in the auction season. Google analytics showed a huge increase in traffic to the website leading up to the auction as well as a large increase in online participation. Over 13,000 registered buyers online and a large increase in phone bidder participation were a clear indication of good things to come. The Baroness was a patron of the Metropolitan Museum of Art and had a lifelong passion for art and collecting antiques. Along with her husband Baron Guy de Gunzburg their collecting interests were wide and varied. 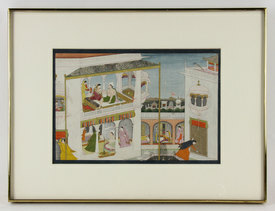 Among the top lots in the sale, eight circa 1800 framed Indian illuminated manuscript pages purchased by the couple from the Doris Wiener Gallery, Madison Avenue, New York City brought over $245,000 collectively and garnered the most interest from collectors as far away as Delhi and Karnataka, India. Bidding was fast and furious on each manuscript lot with several being purchased by the same collector. The most expensive manuscript pages were titled “Royal Tryst” and “Krishna Dances for the Gopis”. They sold for $55,200 each to the phones with buyer’s premium. A third page titled “Blindman’s Bluff” sold for $34,800, “Lover’s Play” for $32,400, “The Marriage of the Nagini” $31,200, “City Scene” $27,600 and “Birth Scene” $25,200, all prices include twenty per cent buyer’s premium. Another collecting category that saw a considerable amount of interest was the Russian silver pieces from the collection. A 19th century Russian silver kovsh marked "P. Ovchinkova “ showing two Vikings with armor, marked "84" in Cyrillic sold for $ 16,800 and a Russian enameled centerpiece with handle, marked "84 / P. Ovchimnkova" sold for $13,500. Her collection of art included two Felix Kelly (New Zealand, 1914-1994) paintings, purchased from Arthur Tooth and Sons, Ltd of London, England, the first titled "The County Church" sold for $6,300 while the second titled "The Squeaky Pavillion" brought $ 5,700, an Andre Dunoyer de Segonzac (French, 1887-1974) watercolor titled "Le Parier Fleuri" with the original sale receipt from the Schoneman Galleries, Madison Avenue, New York City sold for $10,800. An eclectic collection of fine furniture collected in the couples travels throughout Europe featured a rare neoclassical Portuguese bed of carved gilt wood that sold for $6765 while a pair of highly decorative French inlaid tables, with elaborate marquetry on the tops, drawers and shelves sold for $3750 and an18th century French Provincial commode brought $3900. Kaminski hosts its next auction August 14, 2016 with a wide offering of items from Palm Beach, Florida, and other local estates. For more information www.kaminskiauctions.com or call 978-927-2223 to be added to our mailing list. Image: "Royal Tryst," illuminated manuscript page, depicting a princly scene, from Kangra, India, circa 1800.